There’s a number of ways to translate the word “sorry” into Chinese. So which translation should you use? Unsurprisingly, it comes down to context. … when you receive some bad news from a friend you might say: “很抱歉听到这个消息。hěn bào qiàn tīng dào zhè gè xiāo xī. ” I’m sorry to hear that. … when you need to interrupt someone to ask a favour you could start with: “不好意思，打扰你一下。bù hǎo yì sī， dǎ rǎo nǐ yī xià. ” I’m sorry to bother you. And then of course, there’s a third type of situation. The one where you’ve screwed up… and want to apologize. Maybe you did something wrong by accident? Or maybe you did it on purpose, and now you regret it? 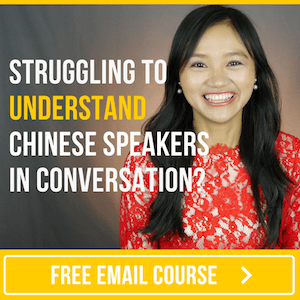 In the video below you’ll hear some phrases that native Chinese speakers often use in this context. Which ones have you heard before? So How Are These 8 Phrases Used? "抱歉！我不能送你去飞机场了。bào qiàn！ wǒ bù néng sòng nǐ qù fēi jī chǎng le. " "Sorry! I can't take you to the airport." 对不起! duì bù qǐ! I'm Sorry! "对不起！我迟到了。duì bù qǐ！ wǒ chí dào le. " 我不是故意的! wǒ bù shì gù yì de! I didn't mean it! / I didn't do it on purpose! "你别哭了！我不是故意的。nǐ bié kū le！ wǒ bù shì gù yì de. " "Don't cry! I didn't mean it!" "我不是故意的。你的相机还好吧？wǒ bù shì gù yì de. nǐ de xiāng jī hái hǎo ba？ "
"I didn't do it on purpose! Is your camera okay? " 你别生气啊! nǐ bié shēng qì a! Don't be mad (at me)! "你别生气啊！我马上去做。nǐ bié shēng qì a！ wǒ mǎ shàng qù zuò." "Don't be mad (at me)! I will do it right now. " "我再也不会撒谎了。你别生气啊！wǒ zài yě bù huì sā huǎng le， nǐ bié shēng qì a！ "
"I won't lie again. Don't be mad at me!" 真不好意思! zhēn bù hǎo yì sī! I'm really sorry! "真不好意思！我把你家的马桶弄坏了。zhēn bù hǎo yì sī！ wǒ bǎ nǐ jiā de mǎ tǒng nòng huài le." "I'm really sorry that I broke your toliet. " "真不好意思！我把你的文件删掉了。zhēn bù hǎo yì sī！ wǒ bǎ nǐ de wén jiàn shān diào le. " "I'm really sorry that I deleted your file!" 我错了! wǒ cuò le! It's my fault! / I made a mistake! "我错了！正确的拼写是… wǒ cuò le！ zhèng què de pīn xiě shì…"
"I made a mistake! The correct spelling is... "
"我错了！请原谅我吧! wǒ cuò le！ qǐng yuán liàng wǒ ba!" "It's my fault! Please forgive me!" 是我不好! shì wǒ bù hǎo! My bad! "是我不好！我忘记带充电器了。 shì wǒ bù hǎo！ wǒ wàng jì dài chōng diàn qì le. " "My bad! I forgot to bring the charger. " "是我不好！我没有告诉你。 shì wǒ bù hǎo！ wǒ méi yǒu gào sù nǐ. " "My bad! I didn't tell you." 下一次不会的! xià yī cì bù huì de! It won't happen again! "对不起！下一次不会的！ duì bù qǐ！ xià yī cì bù huì de！"
"I'm sorry! It won't happen again!" "我不应该对你大吼大叫的。下一次不会的！ wǒ bù yīng gāi duì nǐ dà hǒu dà jiào de. xià yī cì bù huì de! " "I shouldn't yell at you. It won't happen again!"